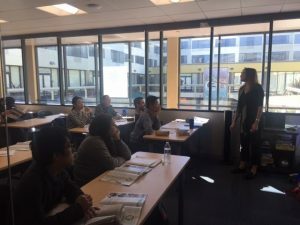 Winter is finally gone and TALK San Francisco is looking forward to welcome international students coming to learn English in the United States with special Spring activities! The long-awaited return of the season is even more celebrated this year because TALK has opened a brand new school in San Francisco! The new TALK facilities in San Francisco are located at Anchorage Square, a complex that offers a spacious outdoor area in the world-famous Fisherman’s Wharf neighborhood and within walking distance of restaurants, boutiques and cultural, historical and entertainment landmarks. The school has recently opened and offers six large classrooms with interactive technology, a warm welcoming reception area, kitchen and free Wi-Fi. One of the main reasons to travel to San Francisco during Spring is the weather. Pleasant temperatures – from 57 ºF to 71 ºF, good for walking around the city, and the flowers begin to blossom, setting excellent landscapes for your selfies. In April, the city hosts a series of events to celebrate the new season, such as Green Film Festival, San Francisco International Film Festival and Bay Area Dance Week. The Northern California Cherry Blossom Festival, held April 13 to 21 in the Japantown neighborhood, is the most traditional early Spring event, with activities such as origami and ikebana exhibitions, fashion shows, cosplay, theater and a great parade closing the festival. Since 1968, the festival celebrates Asian traditions and the alliance between Japan and the United States. April also marks the beginning of the baseball season. It’s your chance to cheer for the San Francisco Giants and get to know Oracle Park, their home stadium, as well as other famous venues like Chase Center. Prepare your foam finger! 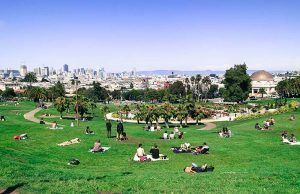 TALK recommends other activities for you to get the most out of everything San Francisco has to offer during Spring, such as a picnic at Mission Dolores Park, a 16-acre area with lawns and palm trees, soccer fields, tennis and basketball courts, playgrounds and areas for walking dogs leash-free. It is one of the best places to enjoy sunny afternoons and the beautiful view of the city’s skyline. In May, the tip is a visit to the California Academy of Sciences at Golden Gate Park, which presents different environments such as the aquarium, planetarium, rainforest and a natural history museum. Among other beauties, you can learn about penguins while they are fed at African Hall and experience the world’s largest indoor coral reef. Also in May, TALK will promote the Diversity Career Expo, where students will have the opportunity to meet business managers from several fields and practice their interview skills. It’s a great opportunity for networking and planning your next career move! Also, TALK San Francisco offers exclusive Business Courses to boost your career. There is still time to enjoy all the beauties of Spring in San Francisco. Contact us and enroll now! 📷 See more photos of TALK San Francisco students having fun on our Instagram.